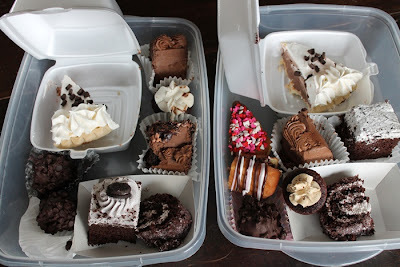 Simply Prim: My Hubby Has An Addiction!!
. . . . . .to candles that is!! Whenever we go to a prim shop, he's always heading over to the candle section and picking them up to smell. (Yes, ladies, he likes going with me to shop for prims and antiques!) We almost always come home with a new candle or two!! And because of his addiction, I have an overabundance of them, which led to the dilemma of running out of space to put all of them! (You can only burn so many and they last for quite a while!) Here is a picture of SOME of them! I had already thrown out a few, plus boxed up some that I plan to sell in a garage sale this spring. I got rid of quite a few more after I took this photo. Here is a sneak peak of the new cupboard we made. And here is a peek at the top. . . . . It really is a fun outing. They hold raffles and various drawings, have a game area called "Candyland" set up for the kids to enjoy, and sell other food items such as pizza and hotdogs for those who don't want to overindulge in so much chocolate. (Never heard of such a thing, myself! lol) You can enjoy eating your treats as you walk around visiting the vendors, or you can sit and socialize at one of the many tables and chairs set up or just take your goodies home with you. Whatever you choose, it's all for a good cause! We look forward to it every year! 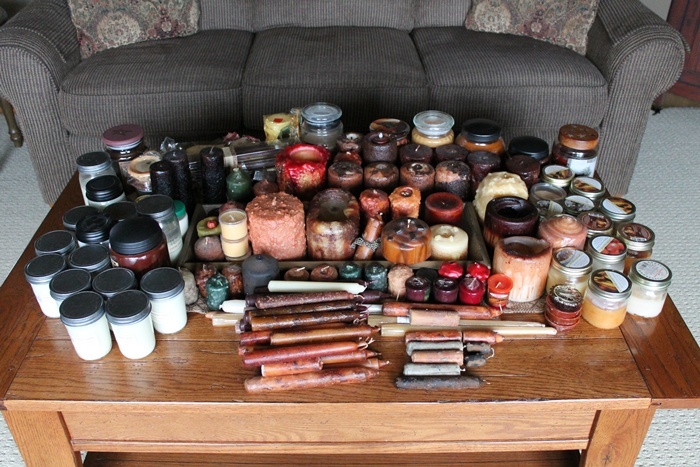 Holy Cow all of those candles..I thought I hoarded candles..Nice selection..Maybe ya can sell them on your blog site..Have a great week..
Oh Kris, don't throw those candles out!! They are perfect for waxing, haha! Every year, I scour garage sales for old, used up candles to throw in my wax bucket. They work perfect for all the waxing that I do... icicles, plastic fruit, eggs, making grubby candles, just anything I can get my hands on! I cringe when you say you threw candles away, lol! Anyway, you have a very nice selection and the cupboard you needed to store them all in is beautiful! 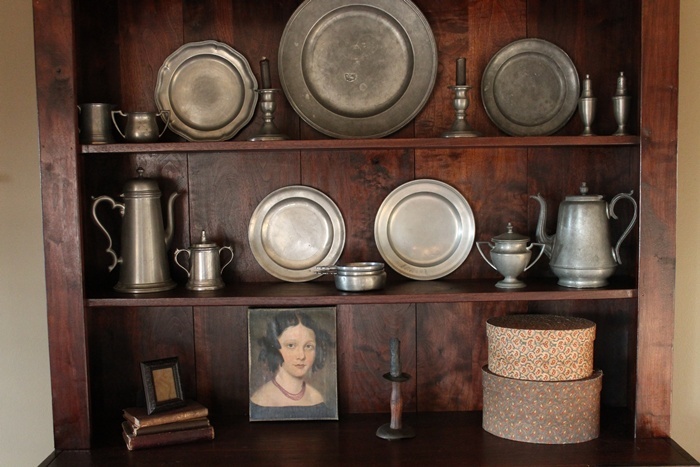 Love the pewter on the shelves. WOWSER!! That is a lot of candles!Love the new cupboard and the displays! Can't wait to see what you won!! I have gotten some good deals lately - a gorgeous pewter pitcher and a great yellow ware mold - yup - changed my mind and got it!! Thank you! Oh Oh I have a candle addiction too..I can't help it...I burn probably 3 a week till gone. Mine are all a spicy homey scent. Wow, That's a crazy amount of candles. Love the cabinet. Hi Kris! 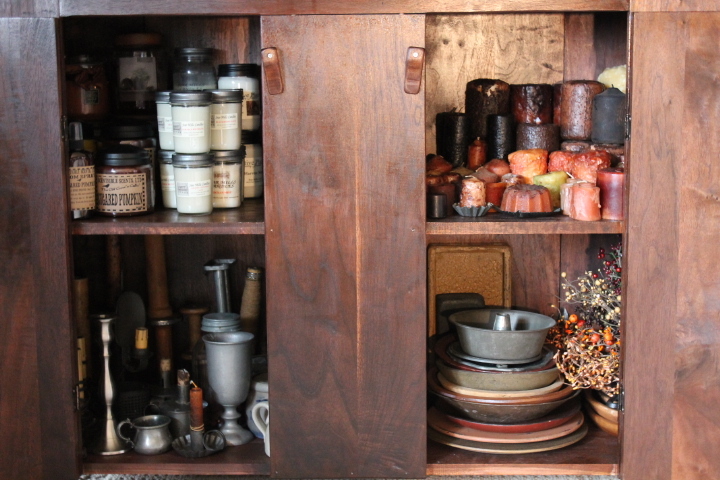 Your cupboard looks wonderful in the sneak peek. Can't wait to see it all, you tease! Looking forward to seeing your new Ebay win, too. That chocolate raffle sounds (and looks) great. Chocolate is my favorite and like you, can't imagine not wanting to over indulge in it! I have a cupboard full of candles, too, but Hubby didn't buy a one of them. Holy Cats ~ That's a lot of candles! Yum ~ Now I have to go raid the candy jar! WOW!! That's a lot of candles! I think you may want to put blinders on hubby next time you go to a prim shop!! :) Would love to see the ENTIRE cupboard--what I saw looks great! Love that cupboard Kris and your pewter is wonderful. ok, that picture of the top of the cupboard, is so beautifully decorated, I had to pin it on Pinterest. That is gorgeous. Hi Kris!...I too am a candleaholic...had to buy a piece of furniture several years ago to house them all...so your hubs is not alone in his addiction, LOL...love that cupboard you two have made and your display is beautiful!...and all that chocolate stuff looks mighty yummy!! Kris ~ I too have an addiction, luv'em, but find it hard to not purchase or to discard any of them. What a GORGEOUS Cupboard...so dark and rich; wonderfully displayed too. Perfect addition to your Beautiful home. Gosh, those are 2 nice trays of Pretty Chocolates. MMMM, I would LOVE to have attended this event. I will certainly be back to see your new winnings and the full view of your (DH's) new cupboard. Such a nice collection it is too!! I am a very visual person, your new cupboard is wonderful and I think having them on display will help him remember how many he has and which ones too!! You can't have to many of something you enjoy. Thank you for stopping by. 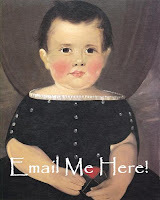 I hope you enjoyed my blog and will visit again. Have a great day! My name is Kris and I live in northeast Ohio with my best friend, Chuck, whom I've been married to for 26 years. We have two daughters, Brittney, 23, Kory, 20, and a son, Justin, 17. 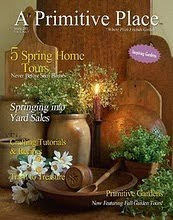 I love decorating with primitives and making things to decorate my home.